A total of 96 species for the month was a bit above the average for the last ten years (which was 94.8 species). It looked as if we were going to do better but poor un-Spring like weather in the last week, when only two species were added, Cuckoo and Sedge Warbler, pulled it back. However, we did reduce the deficit over last year from 16 to 3 species. In any case, at this stage in the year, it is not how many you see but what you see. Our second only Cetti’s Warbler, our first for four years Black Redstart and Grasshopper Warbler, and Spoonbill and Hen Harrier not seen last year, may be significant later on. Spring birds likely to be added next month would include Hobby, Greenshank, Little Tern, Turtle Dove, Reed Warbler and Garden Warbler, Spotted Flycatcher. Heavy rain, fresh northerly winds and cold. And 5 degrees C at home this afternoon, therefore, a no show today. Cloudy with a moderate northerly wind and light rain. Unpleasant! Three Gannets flew west, and later east, one Great Crested Grebe flew west and a Fulmar flew east. In the murky conditions, a Whimbrel rested on the beach by the Obs and three Bar-tailed Godwits (two breeding plumage males and a female) also dropped in for a rest. They were able to get some respite as the foul conditions had cut down on the dog walkers. Some Yellow Wagtails appeared out of the mist and included a party of five which flew north out to sea. 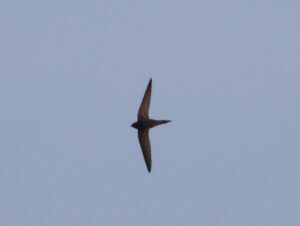 Two Swifts were seen over the estate and seven Swallows flew west. The Cetti’s Warbler continues to roam up and down the east bank occasionally letting out a burst of song. Cloudy with spots of rain, a moderate NW wind and cool. There were two Great Crested Grebes offshore, four Gannets flew east, seven flew west, ten Common Scoters flew east and a Fulmar circled over the Obs several times. A Whimbrel flew west, touching down on the beach briefly. Three Ringed Plovers were on the beach, 34 Turnstones gathered towards high tide and a Common Sandpiper was along the middle brook. Three Sandwich Terns and two Common Terns flew west. Limited vis mig included one Swift, nine Swallows, four Yellow Wagtails, 30 Goldfinches and 12 Linnets. A male Wheatear was on the beach, the Cetti’s Warbler was present for its eight day and a Sedge Warbler suddenly burst into song behind the Obs at 11 am. Our first Spring record for four years. A quiet morning with two Swifts, movement of Swallows and Sand Martins but not House Martins. 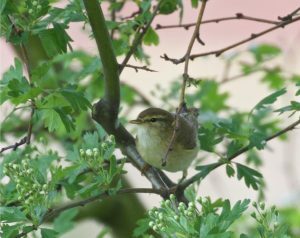 The Cetti’s Warbler was still present and there were two Willow Warblers in the churchyard. A Sparrowhawk taking a Turnstone was perhaps an unusual prey item. The Great Crested Grebe was again in the brook but two dog walkers took it upon themselves to try and catch it with nets! Apparently, it looked “knackered” but it swam off and hasn’t been seen again. Sunny, cool with a fresh SW wind. A light vis mig with four Swifts, one Sand Martin, 32 Swallows, two House Martins, 76 Goldfinches and 12 Linnets west. There were 58 Turnstones roosting on the beach at high tide. The Cetti’s Warbler continues to sing unseen along the east bank. We need a change in the weather. Cloudy with a light SW wind. A much quieter day with a Cuckoo, flying west high over the sewage works, the highlight. There was little other vis mig save for seven Swallows, two Yellow Wagtails, five Goldfinches and 13 Linnets flying west. There was one Great Crested Grebe on the sea, two Fulmars and a Common Scoter flew east and on the beach at high tide there were three Ringed Plovers, a Sanderling and 67 Turnstones. Two Sandwich Terns and a Brent Goose flew west. The Cetti’s Warbler continued to be heard but not seen along the east bank, where a Lesser Whitethroat was also singing and a Common Whitethroat was performing aerial displays in the scrub. Sunny with a moderate SW wind and cooler. A return to Spring after a premature bout of Summer! This was more conducive to vis mig and totals included our first six Swifts, 14 Sand Martins, c50 Swallows, five House Martins, three Meadow Pipits, ten Yellow Wagtails and a few Goldfinches and Linnets. It was a good day for raptors too with the prize going to a ringtail Hen Harrier flying west low over the sea at 7.30 am and later appearances of a female Marsh Harrier, three Sparrowhawks and a Buzzard. Waders included our first Common Sandpiper of the year which commuted between the beach, the brook and the Marsh Pool, as the vagaries of disturbance dictated and a roost of 80 Turnstones which harboured three guest Sanderlings. Two late Brent Geese flew east close inshore, eight Mediterranean Gulls , a Sandwich Tern and two Common Terns flew west. There were two Wheatears on the beach, the Cetti’s Warbler was still present along the east bank and a Lesser Whitethroat was singing opposite the Obs. Sunny and warm at first but a freshening easterly wind cooled things down considerably. Yet again conditions didn’t look good for vis mig and they weren’t. However, Andy started us off with a fine male Ring Ousel which dropped into the trees at the back of the upper brook and promptly disappeared. Whilst taking that in, he heard an unmistakable burst of Cetti’s Warbler song coming out of the depths of the east bank bushes. This was only the second record for the site after one on 29th October 1995! That one was heard by Mike Gould and a visiting RSPB group from Thanet (I think). Visits from RSPB groups to Swalecliffe are equally rare. This came at at time when the population was still recovering from the extinction brought about by the severe winters in the 1980s. The bird got a specific mention in the Kent Bird Report of that year. Four Red Kites drifted west during the morning but the only other vis mig consisted of a couple of Swallows and Yellow Wagtails. A Great Northern Diver was seen offshore (the first for a week), four Fulmars flew east and three Canada Geese did a circuit of the area. Waders were few but included 15 Oystercatchers, 25 Turnstones and a Whimbrel. One Sandwich Tern flew west. Sadly, the brook-haunting Great Crested Grebe appears to have a broken leg. Today it swam along to the upper brook where, despite it being very shallow, it was seen to be catching small fish by snorkelling. Sunny, calm and very warm. We are greeted all the time with “isn’t it a lovely day”. It is but clear skies with no wind, however warm, is not a recipe for visible Spring migration. There was nothing moving over land or sea. A Whitethroat sang a bit late morning in the scrub (a second bird was present) and this was an addition to the year list. A Whimbrel was seen on the beach but six Oystercatchers, two Curlews and about 25 Turnstones were the only other waders seen. 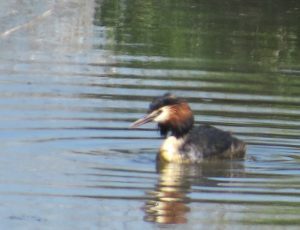 There were two Great Crested Grebes on the sea whilst the bird in the brook was present for its fourth day. A Green-veined White at the Obs was our 11th butterfly of the year and there were also Brimstone, Small Tortoiseshell, Orange-tip and Small White about. That may be all the species seen by the end of the month as the only others seen here before the end of April has been an occasional Small Copper and Painted Lady. Sunny, calm and very warm. 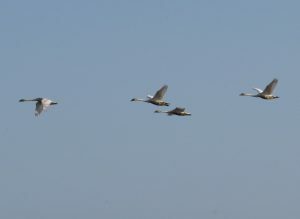 Four immatures Mute Swans flew west close inshore. There were 44 Turnstones roosting between the groynes, a single Sanderling was on the beach and seven Redshanks were roosting on the Marsh Pool. Only one Swallow flew west and one Yellow Wagtail was heard. A quiet day but one that produced three additions to the year list with a Green Woodpecker calling from the sewage works, a Lesser Whitethroat in the bushes opposite the Obs and a single Redpoll flying west. Butterflies included two Orange-tips and another sighting of Brimstone. 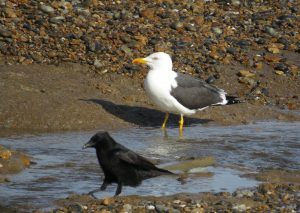 Ted Lee reported two Red Kites flew west along the beach during the morning. Sunny, light to moderate southerly wind, warm. An adult Gannet, a drake Shoveler and seven Mediterranean Gulls flew west. Waders included 87 Turnstones roosting between the groynes and seven Redshanks roosting on the Marsh Pool. Vis mig included one Stock Dove, 55 Woodpigeons, single Sand Martin, Swallow and House Martin, two Meadow Pipits, a Yellow Wagtail, 39 Goldfinches and 25 Linnets flying west. There were also three Willow Warblers, a Jay, two Rooks and a Peregrine. Warm weather brought out three new butterflies for the year; two Speckled Woods, a Large White and a Holly Blue. We have emerged from a week’s gloom to a bright, sunny and much warmer Spring-like day. However, the birds have yet to hear about it. The four Great Northern Divers appeared again as the tide came in but were together only briefly. The divers had to run the gauntlet of jet skiers but they just nonchalantly dived and came up again as if nothing had happened. There was a good turnout of the usual suspects augmented by Julian Russell and Richard Smith. There were also six Great Crested Grebes offshore and a Fulmar flew west. Typical at this time of the year, there were five Greylag Geese flying west, a flock of nine Shelduck west and smaller numbers east or west. Waders included two Whimbrel west and there were 118 Turnstones, two Sanderlings and a Dunlin roosting amongst the groynes at high tide. A total of 41 Redshanks were roosting on the Marsh Pool, a high number at any time and more surprising given the lateness in the season. A few Swallows and a single House Martin flew west and the Grasshopper Warbler continued to sing fitfully and, for the most part, invisibly in the scrub. The warmer weather brought out butterflies with a second showing of Brimstone, a few Small Whites and Peacocks and a Comma. Cloudy, dull but a marked improvement on recent days, with a light SW wind. A Grasshopper Warbler was singing occasionally near the bluethroat bush; our first for three years. A Willow Warbler was also in the scrub. There was a trickle of Swallows flying west (c12) and a single Sand Martin. 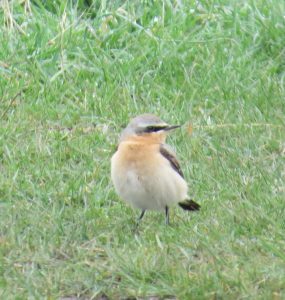 A Wheatear appeared along the coastal path mid-morning. Waders included three Whimbrel west and two Ringed Plovers, five Sanderlings and c70 Turnstones on the beach and 14 Redshanks were on the Marsh Pool. Two Sandwich Terns were offshore. A group of four Great Northern Divers were close inshore as the tide came in; an unprecedented number for the site. Away visiting relatives in Yorkshire. 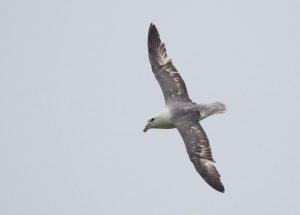 It appears it was cool and murky throughout the period (as it was in Yorkshire) but Andy managed to track down a few additions to the year list. 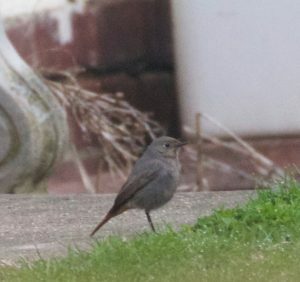 Best was a Black Redstart in the churchyard on 9th (still present the next day when it was seen by Ted). This was our first for four years and so a bad one to miss. A Common Tern on 9th was also a new bird for the year. A Green Sandpiper was seen briefly on the Obs Pool on 11th before being flushed (yet another example of dogs rescued at the expense of wildlife), a Willow Warbler was new on 12th and our second Wheatear was also present that day. Cloudy, calm, light rain . A Great Northern Diver and three Great Crested Grebes were offshore. Three Shelduck flew west and a Little Egret and a Grey Heron were in the brook. Waders included nine Sanderlings and 34 Turnstones on the beach. A first-summer Mediterranean Gull flew west and there were ten Sandwich Terns were offshore. Vis mig included four Sand Martins, 42 Swallows and two Yellow Wagtails flying west.